Ammar Abdulhamid is a liberal Syrian pro-democracy activist whose anti-regime activities led to his exile in September of 2005. He currently lives in Silver Spring, Maryland, with his wife, Khawla Yusuf, and their children, Oula (b.1986) and Mouhanad (b. 1990). He is the founder of the Tharwa Foundation, a nonprofit dedicated to democracy promotion, peace-building and post-conflict reconstruction. Ammar was born on May 30, 1966 to a well-known artistic family in Damascus, Syria. His mother, Muna Wassef, is a superstar actress known throughout over the Arab World, and his late father, Muhammad Shahine (died on January 17, 2004), was a famous filmmaker and for years the director of the Syrian Foundation for Cinema. Ammar spent an important part of his life in the United States (1986-1994) studying astronomy and history. He graduated from the University of Wisconsin – Stevens Point in 1992 with a BS in history), and returned to Syria in September, 1994. 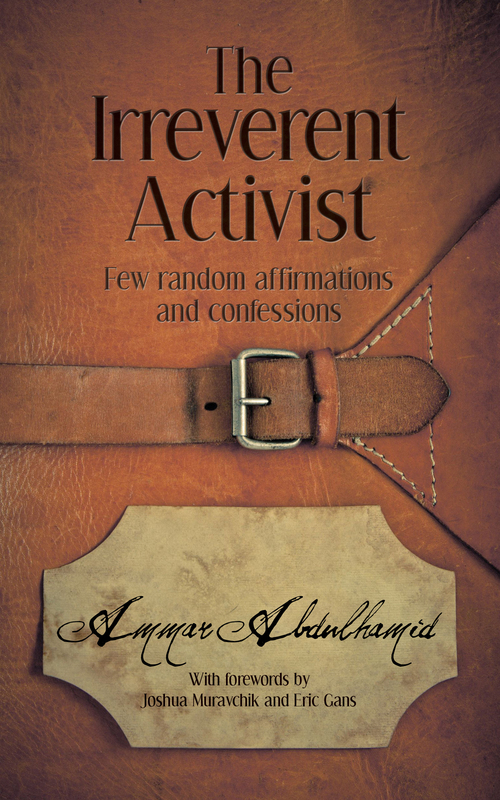 Following years of haphazard living, spent teaching, writing and working as a simultaneous translator and consultant to various European and international developmental programs, and despite having managed to get two of his literary works published (a poetry collection, The Voidman, and a novella, Menstruation), Ammar finally decided to get more seriously involved in challenging the social and political establishment in his country. Casting a “No” vote in the presidential referendum of 1999 marked the beginning. According to official figures, Ammar’s “No” was one of only 219 such votes. By comparison, there were 9 million “Yes” ballots. Secret balloting was not allowed. In 2001, Ammar met and married Khawla Yusuf (born on September 26, 1968), a Syrian fashion designer and activist with her own rather complicated experience with life and religiosity. Khawla was a widow and had two children: Oula (1986) and Mouhannad (1990). The four have stuck together ever since. Later that year, and in cooperation with Khawla and a number of friends, Ammar established DarEmar, an NGO in the guise of a publishing house dedicated to raising the standards of civic awareness in the Arab World through a wide range of activities and programs, including book-publishing, organizing conferences, seminars and workshops, and launching a variety of electronic forums and services. Shortly thereafter, the DarEmar team launched the Tharwa Project, a program designed to shed some lights on the aspirations and concerns of the religious and ethnic minorities in the Middle East. It was this unique focus of the Tharwa Project, in a country where the ruling family descended from a minority background and survived by playing on the sectarian fears of religious minorities, as well as Ammar’s growing criticism of the regime and its leaders, including describing President Bashar Al-Assad a Fredo Corleone in international press and issuing call for civil disobedience in the country that finally sealed Ammar’s fate, and led to his exile on September 7, 2005. Once in Exile, Ammar and Khawla worked together to transform the Tharwa Project into the Tharwa Foundation which remains dedicated to the causes they first championed in Syria. Tharwa’s role in the making of the Syrian Revolution. Tharwa’s Current Projects: Syria in Transition. Tharwa’s Current Projects: Syrian-American Network for Aid and Development (Sanad). In fact, Khawla and Ammar’s activities and those of the Syrian network of secular prodemocracy and human rights activists have been credited with helping pave the way to the nonviolent protest movement that swept the country in 2011, especially through their TV program First Step, which aired via satellite between 2009 and 2011 and openly advocated a nonviolent revolution in the country.